Married Name Her married name was Goth. Freda (?) married Sheldon Goth. Freda (?) died after 1994. Married Name 18 February 1939 As of 18 February 1939,her married name was Gruber. Lucinda M. Raschien married Lloyd J. Gruber, son of Christian D. Gruber and Katherine M. Stelter, on 18 February 1939. Unknown (?) married Otto W. Meyer, son of Heinrich Wilhelm Meyer and Wilhelmine Katherina Henrietta Estorf. Unknown (?) died in January 1956. Richard Addison Meyer was born on 17 February 1909. He was the son of Otto W. Meyer and unknown (?). Richard Addison Meyer married Hazel Hintz on 23 July 1932. Richard Addison Meyer died on 8 March 1958 at Reedsburg, Sauk, Wisconsin, at age 49 Richard A. Meyer, son of the late Mr. and Mrs. Otto Meyer, was born Feb. 17, 1909, and passed away at the Reedsburg Municipal hospital on March 8, 1958, at the age of 49 years and 18 days. On March 21, 1909, he was brought to the Lord in the sacrament of Holy Baptism administered by Rev. F. P. Popp. On April 9, 1922 he renewed his baptismal vows personally in the rite of Confirmation becoming a communicant member of St. John's Lutheran church of Rock Springs and had served it faithfully ever since. On July 23, 1932, he was united in marriage to Hazel Hintz. This union was blessed with one daughter, Karin. Mr. Meyer was engaged in the business of trucking for many years, owning and operating his own trucking firm. Though he had not been in the best of health, his death came very unexpectedly. Surviving are his wife Hazel, a daughter, Karin; and a brother, Kenneth of Muncie, Ind. Funeral services for Mr. Meyer were held Tuesday, March 11, at St. John's Lutheran church of Rock Springs, Pastor R. A. Siegler officiating. Hymns were sung by the church choir. Pallbearers were Harry Haskins, Carl Behnke, Marion Pfaff, Russell Pfaff, Ed Klitzke and Lloyd Frese. He was laid to rest in Oak Hill cemetery at North Freedom. Richard Addison Meyer graduated in 1927 at Reedsburg High School, Reedsburg, Sauk, Wisconsin. Kenneth Meyer was the son of Otto W. Meyer and unknown (?). Francis M. Ruhland was born on 28 October 1926 at Plain, Sauk, Wisconsin. He was the son of John C. Ruhland and Elizabeth Hartl. Francis M. Ruhland died on 13 August 2018 at age 91 Francis M. Ruhland, age 91, of Reedsburg, formerly of Plain, died on Monday, August 13, 2018 in the Sauk County Health Care Center. He was born on October 28, 1926 in Plain, the son of John and Elizabeth (Hartl) Ruhland. Francis drove dump truck for Ed Kraemer and Sons and later he drove school bus for the River Valley School District. Survivors include his son and daughter-in-law: David and Teri Ruhland, of Reedsburg; two brothers: Charles (Sally) Ruhland, of Plain and Ralph (Pat) Ruhland, of Sauk City; one sister: Lorraine Runyan, of Spring Green; many nieces and nephews; other relatives and friends. He was preceded in death by four brothers: Raymond, Alfred, John and Sylvester Ruhland; and four sisters: Bernadine Heimbecker, Amelia Pauls, Elizabeth Ruhland and Rose Ruhland. Funeral services will be conducted at 11:10 A.M. on Friday, August 17, 2018 at the Sauk County Health Care Center Chapel in Reedsburg with Father David Carrano officiating. There will be a visitation from 10:00 A.M. until the time of the service on Friday at the Health Care Center. In lieu of any plants or flowers, please consider a memorial to the family. The Hoof Funeral Home is serving the family. [S250] U.S. Federal Census 1930 U.S. Federal Census, by Ancestry.com, Year: 1930; Census Place: Franklin, Sauk, Wisconsin; Roll: 2609; Page: 6B; Enumeration District: 13; Image: 120.0. Married Name Her married name was Reiner. Lucille Ruhland married Edmund Reiner. Lucille Ruhland was born circa 1923 at Wisconsin. She was the daughter of Simon J. Ruhland and Christina Schwartz. Edmund Reiner married Lucille Ruhland, daughter of Simon J. Ruhland and Christina Schwartz. Elsie Ruhland married Cletus Haas, son of Ludwig L. Haas and Esther M. Ruhland. Elsie Ruhland was born on 18 September 1934. Married Name Her married name was Tollefson. Bernice Christina Ruhland married Tilmer Tollefson. Bernice Christina Ruhland was born on 15 July 1930 at Plain, Sauk, Wisconsin. Bernice Christina Ruhland died on 21 July 2000 at Madison, Dane, Wisconsin, at age 70. Tilmer Tollefson married Bernice Christina Ruhland, daughter of Simon J. Ruhland and Christina Schwartz. Sylvester Ruhland was born circa 1912. [S243] U.S. Federal Census 1920 U.S. Federal Census, by Ancestry.com, Year: 1920;Census Place: Franklin, Sauk, Wisconsin; Roll: T625_2015; Page: 10A; Enumeration District: 164; Image: 88. Name Variation Carolyn A. Ruhland was also known as Caroline. Carolyn A. Ruhland married Wilbert Reiner. Carolyn A. Ruhland was born on 3 March 1924 at Plain, Sauk, Wisconsin. Carolyn A. Ruhland died on 23 November 1969 at Madison, Dane, Wisconsin, at age 45. Wilbert Reiner married Carolyn A. Ruhland, daughter of Simon J. Ruhland and Christina Schwartz. Wilbert Reiner died before 2002. LaVerne Richard Ruhland was born on 28 August 1928 at Plain, Sauk, Wisconsin. He was the son of Simon J. Ruhland and Christina Schwartz. LaVerne Richard Ruhland died on 16 March 1990 at Dane, Wisconsin, at age 61. Cheryl Kurth was the daughter of Jerome Kurth and Vera Schulz. Cheryl Kurth died before 2009. Name Variation Judith Madeline Joyce was also known as Judy. Married Name 15 April 1994 As of 15 April 1994,her married name was Dischler. 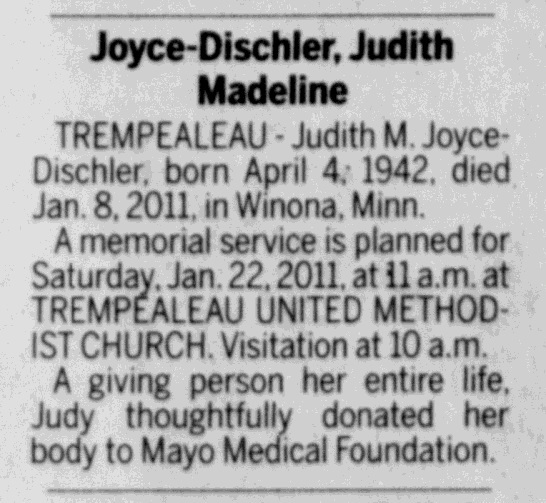 Married Name 15 April 1994 As of 15 April 1994,her married name was Joyce-Dischler. Judith Madeline Joyce was born on 4 April 1942. She married James L. Dischler, son of Michael Simon Dischler Sr. and Lorraine Claire Thering, on 15 April 1994. 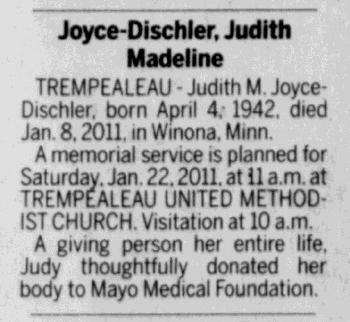 Judith Madeline Joyce died on 8 January 2011 at Winona, Minnesota, at age 68. Married Name before 1990 As of before 1990,her married name was Dischler. Married Name August 1993 As of August 1993,her married name was Dearborn. Phyllis M. Liegel was born on 11 August 1940 at Loganville, Sauk, Wisconsin. She was the daughter of Edward G. Liegel and Alma Ring. Phyllis M. Liegel married James Dischler before 1990. Phyllis M. Liegel married Wayne A. Dearborn in August 1993. Phyllis M. Liegel died on 20 May 2008 at Plain, Sauk, Wisconsin, at age 67 Phyllis (Liegel) Dischler Dearborn obituary. Wayne A. Dearborn married Phyllis M. Liegel, daughter of Edward G. Liegel and Alma Ring, in August 1993. Wayne A. Dearborn died after 2008. Ken Liegel was the son of Edward G. Liegel and Alma Ring. Ken Liegel died before 2008. James Dischler married Phyllis M. Liegel, daughter of Edward G. Liegel and Alma Ring, before 1990. James Dischler died before 2008. Name Variation Marilyn Hausner was also known as Marlene. Married Name 28 September 1957 As of 28 September 1957,her married name was Dischler. Marilyn Hausner married John F. Dischler, son of John Baptist Dischler and Mary K. Brickl, on 28 September 1957. Marilyn Hausner died after 1999. Edward Sittig married Naomi M. Ehlers. 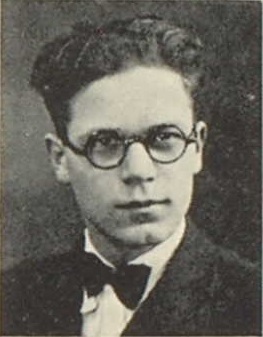 Edward Sittig was born in 1904. Married Name Her married name was Sittig. Naomi M. Ehlers married Edward Sittig. Naomi M. Ehlers was born in 1904. Wes Sittig was the son of Edward Sittig and Naomi M. Ehlers. Wes Sittig died before 2017. Jake Huewe married Leona Thill. Married Name Her married name was Huewe. Leona Thill married Jake Huewe. Nickname Gerald Huewe also went by the name of Buzz. Gerald Huewe was the son of Jake Huewe and Leona Thill. Gerald Huewe married Pat (?). Pat (?) married Gerald Huewe, son of Jake Huewe and Leona Thill. Virginia Huewe was the daughter of Jake Huewe and Leona Thill. Virginia Huewe married (?) Smith.